The 2013 Florida Sportsman Bash. Thank you so much for the fly rod and extras. They were great! I had to take a sneak peak at the rod with the “winner.” Needless to say I was impressed. The “winner” told me he has never fly fished before, but winning that rod is... now forcing him to give it a try. I gave him an older Redington reel of mine for him to begin using. Hopefully he will send us some great photos of his catches for us to place in the magazine in future issues. Read more about The 2013 Florida Sportsman Bash. BKROD Gives Back To TU Veteran Programs. TU keep up the great work!! Support your Local Trout Unlimited Chapter... Click Here. Read more about BKROD Gives Back To TU Veteran Programs. 2013 Bonefish & Tarpon Trust NYC Dinner. The Beaverkill Rod Company was honored to be part of the BTT'S Big Apple Dinner and Auction hosted by the Bonefish & Tarpon Trust on April 4th, 2013. It was a great night for a great organization, and their efforts must be commended... job well done!!... Click Here. Read more about 2013 Bonefish & Tarpon Trust NYC Dinner. HFH... BKROD Salutes all you do!! Support the HFH Foundation... Click Here. Read more about HFH... BKROD Salutes all you do!! We took a Beaverkill tip-action 7 and mid-action 8 weight to Puerto Rico in search of some of San Juan's majestic tarpon. We were told San Juan's lagoon's was the perfect nurse...ry for their worldclass fishey of baby tarpon. And, they were correct, we were hooking up with mostly 20... to 65 pound tarpon. Not, what most would consider a baby, and many would mention we were under-gunned with only 7 and 8 wt. bkrods. 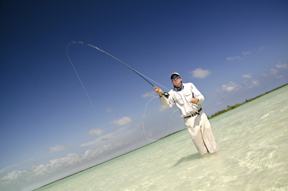 If you fly fish, winter means it's time to head for warmer waters. We took a Beaverkill tip-action 7 and 10 weight to southern Mexico in search of some of the flats' most challenging fish. Thanks to our hosts at Costa de Cocos Lodge in Xcalak, and fishing travel guru Brian Hodges of Double Haul Travel, we had a fantastic time, with multiple bonefish landed over 3 days of fishing. Despite some wind and rain showers, we managed to land a permit, some barracuda, some large mangrove snapper, and had shots at tarpon, huge jacks, and snook. Superb time had by all! Our friend and long-time resident of Bozeman, Montana -- David Thompson -- got out with his Beaverkill 9' 6 weight midflex for one of his last days fishing this past October. Guide Zach and his pal Robert had a fantastic day on the water, with several chunky fall browns landed on streamers, and no other boats to be seen all day. We took our Beaverkill 9 foot 6 weight mid flex and fished some of the renowned rivers in southwest Montana this past fall with guide Zach, out of The River's Edge in Bozeman. The rod was tasked with throwing streamers and big dries, and did a fantastic job. We had good conditions, but occasional wind, so the rod was put to the test. After some decent fish throughout the day, we finally hooked into a big brown within sight of the take out. Send us your fish stories! Someone has to be out there, making sure our rods can catch fish, right? Send us your fish stories and we'll post them on our site. Be sure to include exactly where you were, so we can steal your spot -- just kidding! We always enjoy hearing about your best days out on the water, and promise not to publish any top secret info. Send your photos (web resolution) too! Read more about Send us your fish stories!